The new Dwarf-based Next playtest game we are starting is going to have a significant underground component to it - which means I've had to think about both above and below-ground mapping. I'm pretty happy with how the aboveground map is turning out, and combining it with landscape/location shots on the tumlr is something that I think is really nice. Great to give a visual feeling to the locations. I'm also setting up a scaling world map, with nested hexes for increased detail. All very nice and working well. Underdark mapping is harder, though. It doesn't lend itself well to a traditional hex or wilderness map, since your choices are limited to specific paths or routes. This makes it inherently a node or path-based map. As far as I'm concerned, there are about 4 critical features that I, as the DM, need to know on an underdark map. 1) Physical connections between locations. Since you are limited to following tunnels or routes when underground, I need to know which routes go where, and what areas/locations they connect to. 2) How physically difficult the route is. Underground travel is much more physically demanding and difficult than overland travel - similar to high mountains, but with added hazards. A challenging route would potentially include serious climbs, narrow areas and water hazards. Challenging routes mean slower travel. 3) How dangerous the route is. Similar to how difficult the route is, but this measures likelihood of hostile random encounters. It is also an indicator of how often the route is patrolled by friendly forces, or how well-guarded/secure it is. Dangerous routes mean more random encounters, and more unpleasant encounters. 4) Connections up or down. If a route or area goes to the surface, that's a big deal. Technically, underdark maps should be fully 3d, but in practical terms, it's easier to design in z-levels, like Dwarf Fortress maps, so identifying various "levels" of the underdark and mapping what areas and routes go down or up is helpful. Now, my feeling is that a good map needs to be able to transmit all important information quickly and in an intuitive fashion. Line thickness indicates the physical difficulty. The thicker a line is, the easier it is to traverse. 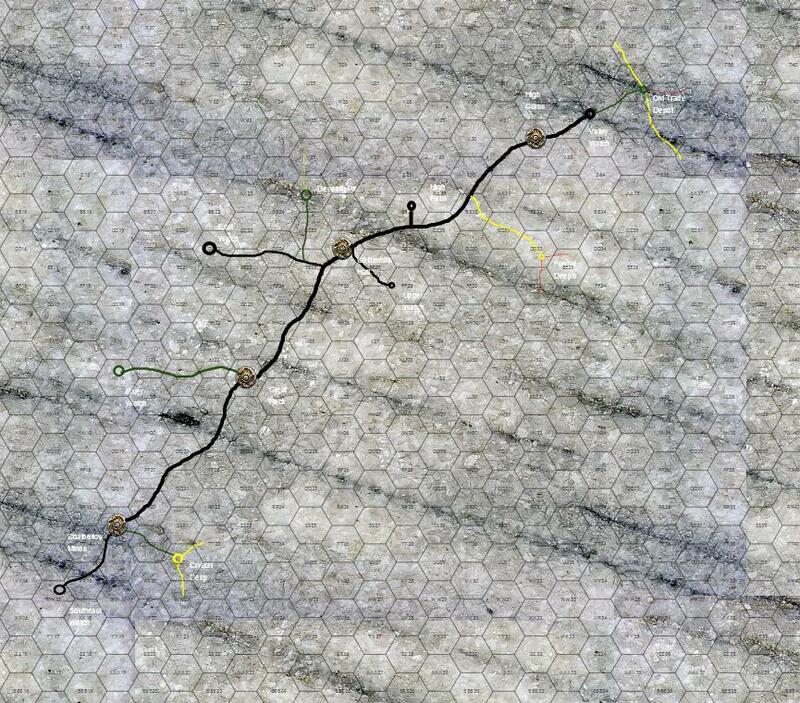 Bold black lines are the underdark equivalent of a paved road, down to the very thin lines, which are basically unimproved cavern, with all the hazards that implies. In terms of travel time, I double it for each of the 3 line thicknesses. So a 1-day journey would be 2 days on a mid-thickness line and 4 days on a thin line. Line color indicates the danger level of the route. 1 Merchant with porters. Probably friendly, likely inclined to swap stories or trade. 2 Paths Guild scouts/patrol. Brisk, professional, curious about what you’re up to. 4 Kobold raiders – d6 skulking raiders looking for something to steal. 5 Giant Spiders – d4 Giant spiders with a hunger on. 7 Goblin snatchers – d10 goblins looking for something to kill, eat or mate with. They ain’t picky, either. 8 Duergar patrol – 1 fist (5 duergar) on patrol. They will kill to ensure they aren’t reported. 10. Grey ooze. Hard to tell it’s there until your boots start melting. Oh, you were sitting down? 12. Something really weird from the special encounter list. Locations generally will have connection up/down info included in the description. For smaller sites, they are depicted with a circle. White center means it connects to the surface. Black center means it connects to a lower level. Grey center means it connects to both. Blue center means no connections.